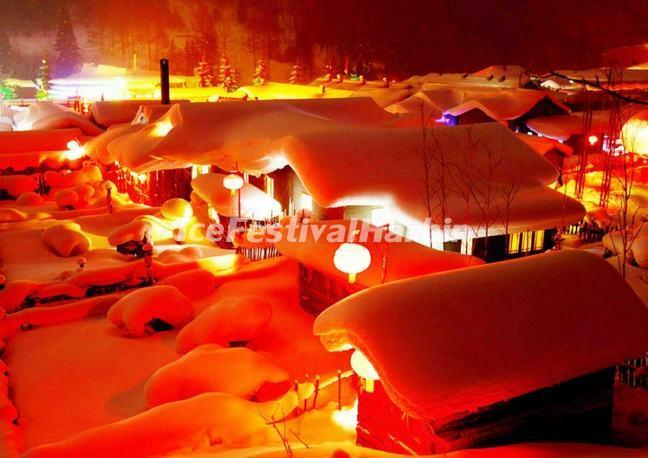 China's Snow Town, a beautiful village, aptly named Zhong Guo Xue Xiang, or "home of snow". 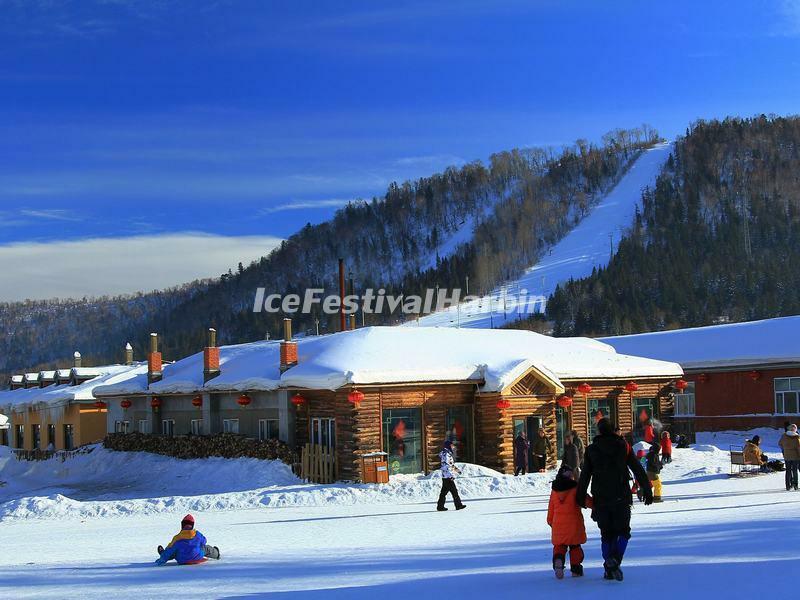 Located in the Shuangfeng Wood Farm in Hailin City (under the jurisdiction of Mudanjiang City), the village is about 280 kilometers away from Harbin, the capital city of Heilongjiang Province. The village is at an elevation of 1,500 meters and covers an area of 500 hectares. It consists of around twenty wooden houses decorated with strings of golden corn and red chili hung to dry. In winter the snow here can reach up to two meters. This absorbs sound creating a winter wonderland. 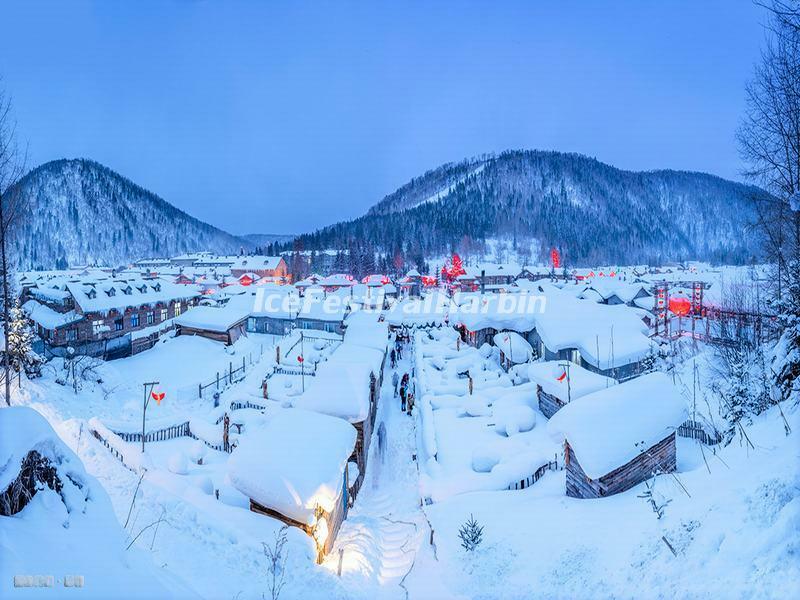 Though endowed with the most pure snow and beautiful snowscape in the world, the Snow Town was not known to the outside world until it was discovered by some shutterbugs and their photos won the international price in several years ago. Soon after that, some teleplay groups set their bases here and took many famous TV plays and films, such as She's My Ex-wife, Cool In Summer And Warm In Winter, Winter Of The Wacky King, Heilong Town And The Snowstorm, Snow Town, Brave The Journey To The Northeast (Chuang Guandong), The Blowing North Wind (Beifeng Na Ge Chui), The Police Commissioner, The Northern Morning, Where Are We Going, Dad ? and so on. They added more mystery to the farm. China's Snow Town is regarded as a dreamlike paradise in winter. Its high mountains, local traditional wooden houses, animals, trees and the sunrise are all greatly different from those in the other world's snowy areas. 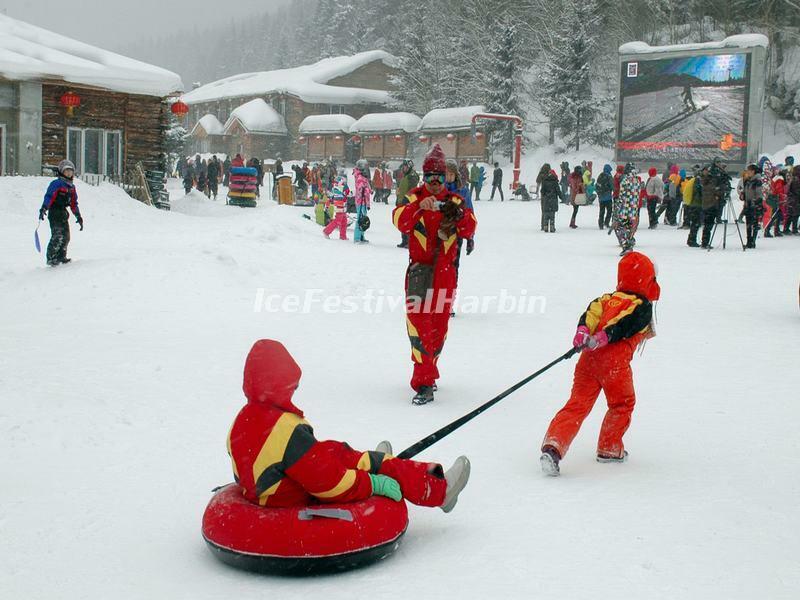 It is a very famous eco-tourist winter attraction connected to the Harbin International Ice and Snow Festival. 1) You can stand on the plank road (the road is behind the town. It winds to the forest and up to a top of a mountain) to have a panoramic picture of the town, or snap the local people, houses, dogs, horses...The best place to take pictures is Dream Home.This small theme park offers the best location to take pictures of the town and the park itself. The houses there are covered with heavy snow and look like mushroom.The best time to take pictures for Dream Home is after dark. The park will become a wonderland when all the houses are lighted at 17:30. 2) Watch the local shows at Dream Home. The shows are performed by the locals in dialect. 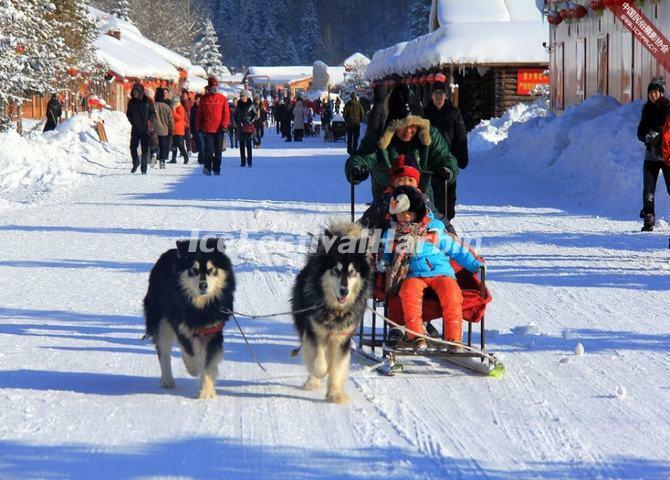 3) Do dog/horse sledding,snowtubing or skiing (there is a ski resort nearby the mountain). 4) Visit China's Snow Town Folk Culture Museum to learn some history and facts about the locals, the town and the loggers. 5) Drive snowmobile (or take cable car) to Yangcao Mountain to watch sunrise from the snow and forest. 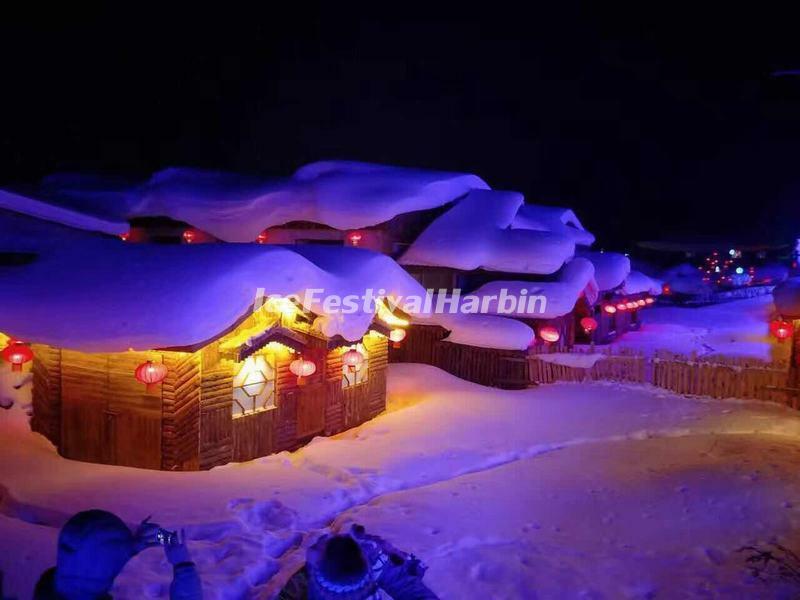 Best Travel Time to China’s Snow Town: Feb. Jan. March and Dec.
Hotels with excellent facilities are available in China's Snow Town. Tourists can also choose the family hotels to have an overnight stay at their Kangtou (brick bed warmed by a fire underneath in Northern China). In China's Snow Town (Xuexiang), we arrange our tourists hike through the villages and forest, or drive the snowmobiles or take the horse/dog pulled sleds to the beautiful Yangcaoshan Mountain to view the beautiful sunrise, take pics, visit the local families and ski there. The northern Chinese cuisines are very delicious and special. Here tourists can enjoy the food at the local farmers' homes or hotels. 1. Fly to Mudanjiang and then take tourist bus to the village. 2. Take train to Mudanjian from Harbin (or other cities) and then take tourist bus to the village. 3. Take train to Changting Town from Harbin (or other cities) and then hire a taxi in the town or take bus at Linye (forestry) Passenger Station to the village. 4. Take train to Linhai City from Harbin (or other cities) and then take bus to the village. 5. Take bus from Harbin (right side of Harbin Railway Station) to Changting Town and then hire a taxi in the town or take bus at Linye (forestry) Passenger Station to the village. 6. 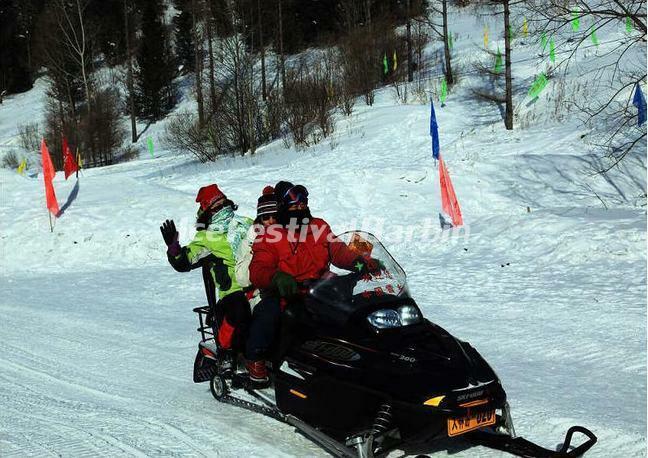 Join our China's Snow Town tour, our guide and driver will take you there. You need not waste a lot of time on the road and bus changing. Well Note: Usually, two days and one night is enough for a trip to China's Snow Town. The tour cost to the town is very expensive (perhaps the most expensive tourist destination in China) for the hotels, food and transport are so expensive. The local hotels only run in the winter months (Dec, Jan and Feb), they usually raise their prices without a warning or a reason. It takes about 6-7 hours to drive to the town from Harbin, the transport fee will make up a big portion of your tour cost for the round trip.